The Mega PC is a computer manufactured and released by Amstrad in 1993 under licence from Sega. It was similar but unrelated to the Sega TeraDrive. It is a standard Amstrad PC with Sega Mega Drive hardware bundled inside, the system was wired to share the dual-sync monitor and speakers with the Mega Drive on a separate circuit board. 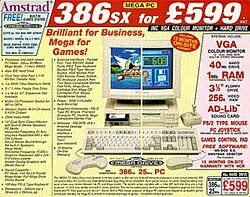 Initially released in PAL areas such as Europe and Australia in 1993, its success was short-lived due to its high price of £999.99 (later reduced to £599) and a CPU that was outdated by the time of its release. It was slightly easier to acquire an Amstrad Mega PC than the Sega TeraDrive system due to higher manufacturing volumes. Both systems have become collector's items. In general, the Mega PC was seen as a better-built device than Sega's TeraDrive, as the unit was more robust and had more efficient air circulation. The Mega PC was IBM-compatible and had a Mega Drive ISA card, a Mega Drive Controller, Keyboard, Mouse, Monitor, Joystick and Internal Speakers. The machine shipped with 1MB of RAM, provided by 4× 256KB 30-pin SIMM sticks. This was expandable to 16MB by using 4× 4MB memory modules. Although it boasted a higher specification than the Sega TeraDrive (having more RAM and a faster processor), the specification of the Mega PC's CPU was a generation old. The newer Intel 80486 was on the market and the first Pentium processors were released the same year as the Mega PC. The system was unable to act as a Software Development Kit due to its inability to simultaneously use the PC and the Mega Drive hardware. A cover on the front of the unit prevented the insertion of a Mega Drive game cartridge while using the PC hardware. The machine's rear houses multiple I/O ports. These include two serial ports, a 25-pin parallel port, a VGA port with combined signals for a standard VGA monitor and sound (Amstrad monitor only), a speaker/headphone jack, and a 15 pin game port for a joystick. 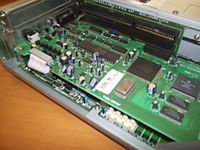 The motherboard includes a 16 bit ISA slot connected to a riser card, providing a total of two 16 bit ISA slots. One of these slots is populated with an ISA card, which provides connections for sound at the rear of the machine and a connection for the Mega Drive cartridge at the front. The other slot was left free for expansion (such as the addition of a modem or Network Interface Card). The Sega TeraDrive includes stereo RCA jacks and composite NTSC video output for connection to a TV, whereas the Mega PC lacks this feature, but could be connected to a PAL TV through SCART. Outputs from both the PC and Mega Drive units are available from a shared VGA connector, but since video output from the Mega Drive is still 15 kHz RGB it works fine when connected to a TV using SCART. When using the PC hardware, only a Multisync or VGA monitor can be used, as the unit outputs video at 31 kHz. The system shipped with an Amstrad branded controller that is internally identical to Sega's, allowing the controllers to be used on either system. Amstrad advertised a second system as the successor to the Mega PC named the Amstrad Mega Plus. This boasted slightly higher specifications, with the processor upgraded to a Cyrix Cx486SLC running at 33 MHz and a RAM upgrade of 4× 1MB SIMM modules (4MB). This was never released. ^ a b "Amstrad MegaPC @". Everything2.com. 2000-10-29. Retrieved 2010-05-30. ^ "Sega Retro: Amstrad Mega PC". SegaRetro.org. Archived from the original on 2014-08-02. Retrieved 2015-02-19. ^ "Assembler: Page 3 (via Archive.org)". Web.archive.org. 2008-05-23. Archived from the original on 2008-05-23. Retrieved 2010-05-30. ^ a b "Amstrad Mega PC Service manual" (PDF). Archived from the original (PDF) on 2009-09-20. Retrieved 2010-05-30. ^ a b "Assembler: Page 1 (via Archive.org)". Web.archive.org. Archived from the original on 2008-06-14. Retrieved 2010-05-30. ^ "1000 BiT +- Computer's description". 1000bit.net. Archived from the original on 2007-09-28. Retrieved 2010-05-30. Wikimedia Commons has media related to Amstrad Mega PC. This page was last edited on 11 October 2017, at 10:12 (UTC).